Below is the Upanyasam Audio of Sri Sri. Anna about Sri.Kurma Kshetram - Click and let play while reading! 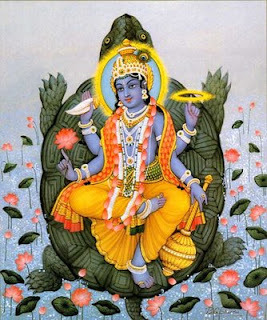 During Krithqa yuga, devas and auras churned the Ksheera Sagara for nectar using serpent Vasuki as thread and Mandaraparvatha as churning stick. The churning stick of Mandara Parvata slipped and submerged. Devas and auras tried but failed to put it in its right place for smooth churning. Mahavishnu to fulfill the desire of Deva appeared as Kurma and lifted the churning stick of Mandara Parvata on His back and enabled them to Churn Ksheera Sagara and nectar. There are some different stories from the epics and Sthalapurana that depict how Mahavishnu manifested Himself as Kurmanadha at Srikakulam. Kurmanadha Swamy temple at Srikakulam is splendid and rich with art and architecture. There are 210 pillars in the temple. Every pillar in the temple has its individual identity. The main temple tower is called Padmavimana . The region consisting of the temple area is called Swethachelam. Dolosaava will be observed with traditional pomp and gaiety in the bright half of Trayodasi in the Lunar month of Phalguna on the day of Uttaraphalguni star. Special festivals will be observed in the month of Vaisakha masam on the eve of Sri Kurma Jayanti. Daily worship and archana are performed in the temple.